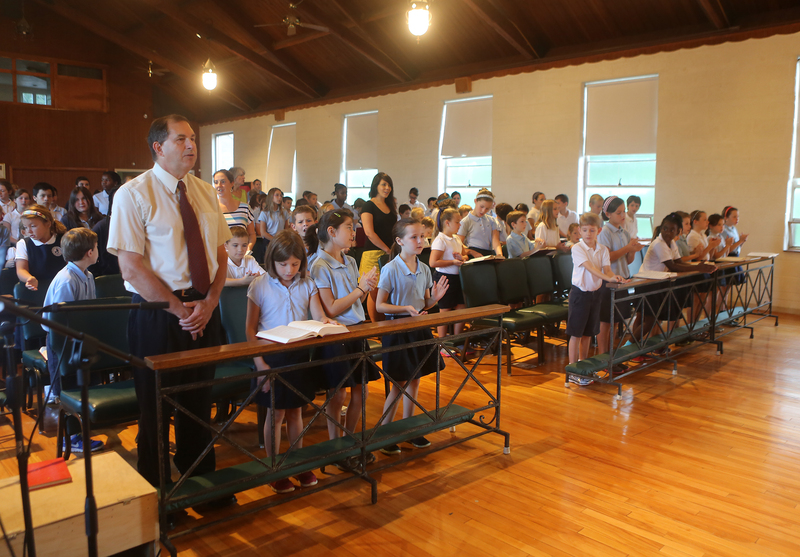 We gather once a week as a school community to celebrate Mass together. The children participate in the liturgy as altar servers, lectors, and cantors. We are grateful to area priests who generously come to celebrate Mass for us. When St. John Vianney Parish merged with a nearby parish and subsequently closed the Church on our grounds, we received permission from the Archbishop to maintain a chapel here at GSCM. Our school community rallied to repair and refurbish the bare sanctuary and update the sacristy. 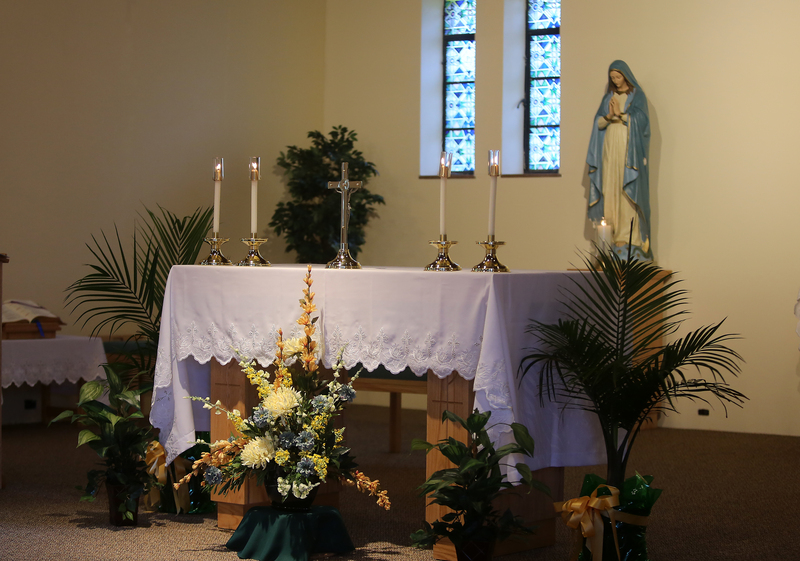 Generous benefactors donated financially to purchase an altar, tabernacle, crucifix, statues, and all the sacred articles needed to celebrate Mass. A local artist, Nancy Carolyn Smith, designed beautiful sanctuary doors depicting angels in worship. In 2017, Nancy also commissioned 4 stained glass windows for the sanctuary. They depict images/names of Mary: Star of the Sea, Mystical Rose, Fruitful Vine, and Queen of Heaven. The windows were blessed and dedicated at the opening school liturgy. If you are interested in supporting the ongoing enhancements in our chapel, helping with stipends for the priests that celebrate Mass and hear confessions at our school, or would like to sponsor the Sanctuary Lamp for 1 month ($20) or an entire school year ($200), we would welcome your gift. You can make an online gift by clicking here or by sending your gift through the mail to The Good Shepherd Catholic Montessori, 4460Berwick Street, Cincinnati, OH 45227. If you have any questions, please call our Development Office at (513) 760-8479. If you wish to have a mass offered for the intentions of a person living or the repose of the soul of a beloved deceased, please call the office at 513- 271-4171 or send your request to The Good Shepherd Catholic Montessori, 4460 Berwick Street, Cincinnati, OH 45227. The standard offering for the Mass is $5.00.